This is the premise for French artist Dominique Gonzalez-Foerster's installation, which just opened on 14 October 02008 at London's Tate Modern: TH.2058. Why that title? Apart from the sly pun on the title of George Lucas's first feature, the work is located in the Tate's gigantic lobby, the Turbine Hall (T.H. ), and is set in the year 02058. Voilà. The deluge scenario -- and especially the idea of reworking the Turbine Hall itself as the setting for a future refuge, lined with bunk beds, and complete with ambient audio of endless rain -- seems to me a fine starting point. But it runs swiftly downhill from there. 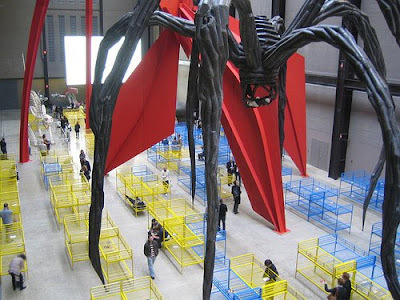 Says one review of the artist's work, "She has plunged us into the future by 50 years and into an immersive scenario on to which visitors can project their own fears and fantasies." Their own fears and fantasies? I find that hard to believe. With a background screening of what she calls The Last Film, a jumble of apocalyptic movie footage (Marker, Watkins, Roeg); the canon of paperback dystopias sprinkled across refugees' brightly coloured bunk beds (Bradbury, Ballard, Wells); and dotted with reworked sculptures (by artists whose names I confess are only vaguely familiar to me); the work is dominated by the derivative, diluted ingredients of others' imaginaries. "Used futures", an evocative term coined by futurist Sohail Inayatullah, suggests itself irresistibly here. The piece has the air of an unfocused pastiche. Guardian art critic Adrian Searle explains, "This is an extended joke about the purpose of art and art galleries..." Really? A cynical exercise in repackaging the insights of tragically prescient artists who came before? Some joke. Atop the basically unobjectionable climate-havoc premise, perhaps it's the trivial surrealism of the twist that bothers me -- overwatered sculptures growing out of control. (Actually, as a 13 year-old kid in Brisbane, Surrealism was the first art movement I ever cared about.) It's also possible that my own work as a designer of experiential futures leads me to insist too much on the coherence of a scenario's premise. In any case, I admit to being disappointed to learn that this large-scale, influential gallery's commissioned installation actually set a half-century into the future -- the first that I know of -- has fallen prey to that debilitating disease, equally afflicting po-mo art and theory, of frenzied referentiality. I don't doubt the value of thoughtfully adapting, remixing, and commenting upon extant images of the future in our culture. Still, a chance to do something much more provocative and important than that -- to render experientially available any one of countless conceivable futures, on its own terms -- has not been merely overlooked here, but flouted. We are meant to ruminate on catastrophe and laugh amongst the ruins of art and civilisation. But you don't need to wait till 2058 to do any of that. The end is now. It saddens me to say that if this is the best that a world-class art institution can muster by way of an "immersive" exploration of our next half-century, he mightn't be far wrong.